Oh. It's you again. Awesome. Vote to see progress work, as always! She has to /talk/. With her /voice/. Ohno. Sev has such a wonderful talent for restating the obvious. Can't wait until next week. Did Tareth loose her hearing later in her life? I've been wondering about that, since to my knowledge people who used to have hearing (as opposed to being born deaf) tend to be better at lip-reading and talking aloud if necessary. Not necessarily - my grandfather was born deaf, and he lip-reads and talks normally (though he sometimes has trouble understanding people who don't move their lips much while talking). He doesn't even know an ounce of ASL sign language. It is easier though for a post-lingually deaf person to learn how to lip read and they would likely already know a verbal language. The sign in panel 2 almost looks like "turtle". oh FFFFF. Now I can't unsee it! OMG that is awesome! Ha! If I helped inspire that, that would be awesome. So... Is that other font supposed to be her voice or something? Or did you change the representation of her signing? It's a little confusing to me. When it's in < > brackets she's signing it, when it's in the loopier script without capital letters it's her actually talking out loud. I'm still laughing over Sev's misfortune with getting stuck on the ladder. POOR GUY I AM SORRY it's just too funny. 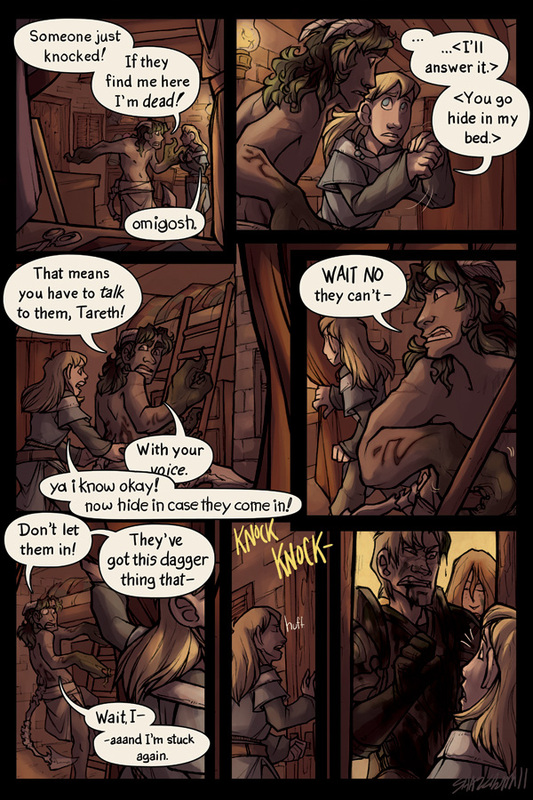 Also Tareth has the best eye-rolling nonchalant attitude through out this whole page as if she's dealt with Sev's crazy shenanigans before. Haha, this comic is great as always, heh.